Looking for safe and reputable iDebit Casinos? Check this review out! iDebit is an online payment method that allows user to make their deposits at online casinos directly from checkout via online banking. The method is available to users worldwide, from Canada to Australia and New Zealand. With iDebit, you don’t need a credit card to fund your casino account, all you need is an online banking account and you can make secure and instant deposits. In addition, players from certain countries are allowed to use this banking option for withdrawals. iDebit is one of the most popular payment methods in Canada, but it can be used by residents of other countries listed on the service provider’s official website as well. To use this banking option, a casino player must have an online banking account with one of the supported banks. iDebit is a fast and secure banking solution you can use without sharing your personal and financial information with the casino of your choice, so let’s see how to do it. If your favourite online casino doesn’t accept iDebit, but you are still interested in this type of technology, you can check Trustly casinos or Citadel casinos for similar services that may be available in your region. iDebit facilitates electronic transfers, using your bank account to pay online in thousands of merchants around the globe, including iDebit Casinos. In order to get started, you need to verify that your bank is listed between the supported banks that operate with iDebit. Although you can use iDebit without registering with it, creating an account will provide you with more options. To open an account, go to the iDebit official website and click the Log In/Sign Up button. Under the tab New User, click the Sign Up button and proceed to fill in all the required personal details like email, name and surname and more. Keep in mind that you can use iDebit as a guest without completing the sign up procedure, but in this case, you can use it as a deposit-only method. Go the Cashier and under the deposit methods choose iDebit as a preferred banking method. 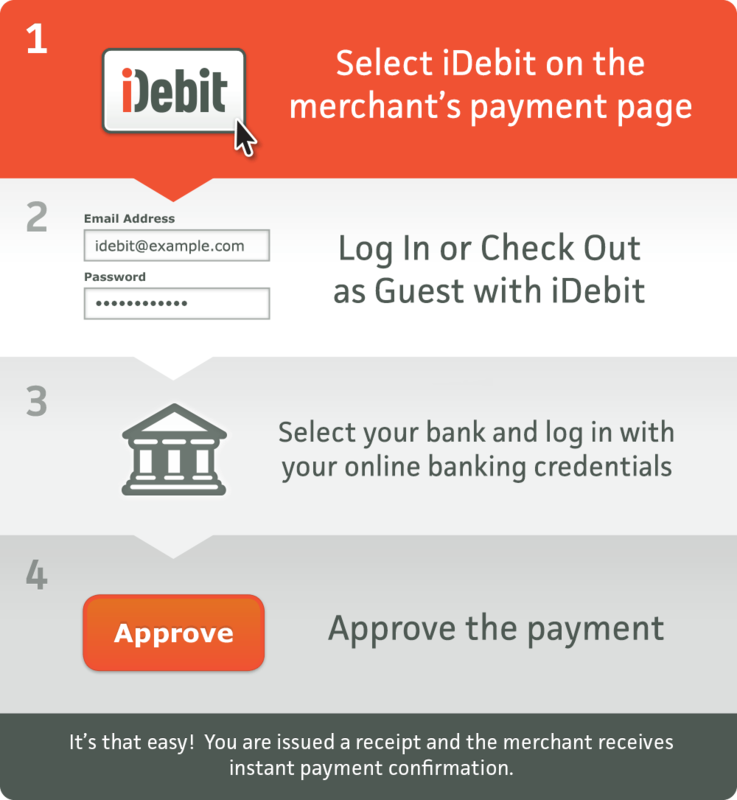 Enter a desired amount and log in into your iDebit account or use the Guest Checkout option. Proceed to choose your bank from the dropdown menu. Log in to your online banking by entering either your bank client card or username and your password. Some online casinos will allow you to withdraw your winnings via iDebit, too. However, this service is available only to those users who have registered with it. Just visit the Cashier and under withdrawal options, choose iDebit as a preferred one. Follow the steps and specify an amount you want to clear from your account, enter your login details to access your iDebit account, choose your bank and approve the transaction. The funds will be sent from your casino to your bank account in a few days. iDebit is a safe and reliable banking method that keep your sensitive financial details encrypted and you don’t have to reveal them to the online casino operator. Deposits made via iDebit are instantly processed, so you can have your funds in your account available for instant wagering as soon as you complete the transaction. All you need to make transactions via iDebit is an online banking account, so you don’t need a credit or debit card to deposit or withdraw. You can use iDebit without creating an account by choosing the Guest Checkout option but if you sign up for the service, it can function as an e-wallet letting you store your funds in your balance. Signing up with iDebit and making your payments from iDebit balance as well as transferring your funds from your casino to iDebit balance are free of additional charges. There are many advantages of using iDebit for online casino transactions, yet there are a few disadvantages we have to mention too. First of all, your deposits made via online banking with iDebit are charged with a $1.50 or £/€1 fee per transaction. Besides, sending money from your iDebit to bank account is charged with a $/£/€2 fee per transaction. Withdrawals via this method are not available to players from all the countries listed on the iDebit website and may take up to 5 working days. Deposits using iDebit are processed instantaneously while withdrawals may take up to 5 days, according to the company website. There are no hidden fees in any transactions, but there’s a fee of $1,50 to make payments using iDebit and a fee of $2,00 to transfer money from iDebit to your bank account. iDebit is an extremely popular casino banking method for Canadian players, but it is also available in other countries like Australia and New Zealand. Basically, this method uses your bank account to send and receive payments, almost free of charge. It functions similarly to Trustly and Citadel, enabling electronic transfers at low cost. One of the biggest advantages is that you won’t need to disclose your financial information to the casino operator or online merchant. Your payments will be processed instantly, allowing you to get started right away, safely. On the downside, iDebit casinos usually won’t process withdrawals using this method, although you may be lucky and find one that is able to do so. In that case, you can expect your earnings to arrive within 5 days, depending on the time that the casino takes to process your request. Here you will need to prioritize between speed and costs. Do you prefer faster withdrawals? Then you may want to choose another method. Do you prefer to wait and pay less for the transaction? Then you may want to go ahead using iDebit, because fees are extremely low comparing to other methods. In any case, there are not many casinos accepting iDebit, like we would expect. I was surprised to find just a couple of brands accepting deposits with it, while most of them won’t allow players to withdraw using the same method. Still, you can find alternative processors that work in the same way. For more information, please check our casino banking page. Connects your bank account. No need for credit cards. Most popular in Canada, Australia and New Zealand. Fewer casinos allow withdrawals with iDebit.